I hope the autumn has brought you peace and joy. Good afternoon from beautiful Bere Island, County Cork, Ireland! I’ve finally purchased my own domain and will eventually be migrating the Ring of Beara blog to the new site. I will save the old posts and create new ones. Please come adventuring with me! News! In less than a month, I will be visiting Ireland. It’s an exciting time for me and I can’t wait to get back to the hills, the sea, and the beauty of the people who call Beara their home. The blog will be up and running with new photos and new stories in the next few week as my plane will be touching down in Eire in the last week of October 2014. I will be ready with camera and notebook in hand, and look forward to sharing my adventures with you. Wishing you much love, peace, and happiness. The weather was glorious yesterday so we decided to make our way to the beach. We chose the shoreline of the Bullig Bay Loop because it is within hiking distance of our home and the trail head is well groomed and easy to access. We started at the entrance to Dunboy Woods (near Dunboy Castle) and followed the path. Parts of the trail are richly forested with ruins of guardhouses, watchtowers, and walled enclosures tucked here and there in the undergrowth. It will only be a matter of time before Nature reclaims it all. The path winds easily down to Bullig Bay. It is so beautiful! There’s an accessible little island in the centre and the water is clean and clear. Large fish were lazily swimming around the floating kelp beds, their fins sparkling in the sunshine. The beach is rocky so I would recommend sandals or water shoes if you plan to go for a swim. That being said, there are parts of the beach where the stones have been finally ground by the waves, making it more comfortable for walking barefoot or just stretching out in the sun. Because the day was still beautiful we decided to take the long way home and continue on our journey around the Bullig Loop. The trail takes you through forest and then up to a well marked stile and farmer’s field. This is where things get a little tricky. Once through the stile you look up, way up a hill with a narrow pathway. It’s important to get your bearings here because, as you can see, the path is virtually invisible at first. The important thing to do is look for the trail marker. See it there? Way at the top? It looks like a little stick just right of centre. That’s the direction we needed to go. Although this last leg of the Loop was a little steep it was totally worth the hike even though we’d already put in a full day at the beach. The views of the Ardnakinna Lighthouse on Bere Island were stunning. I’m hoping to get over there to explore the island before the end of summer. 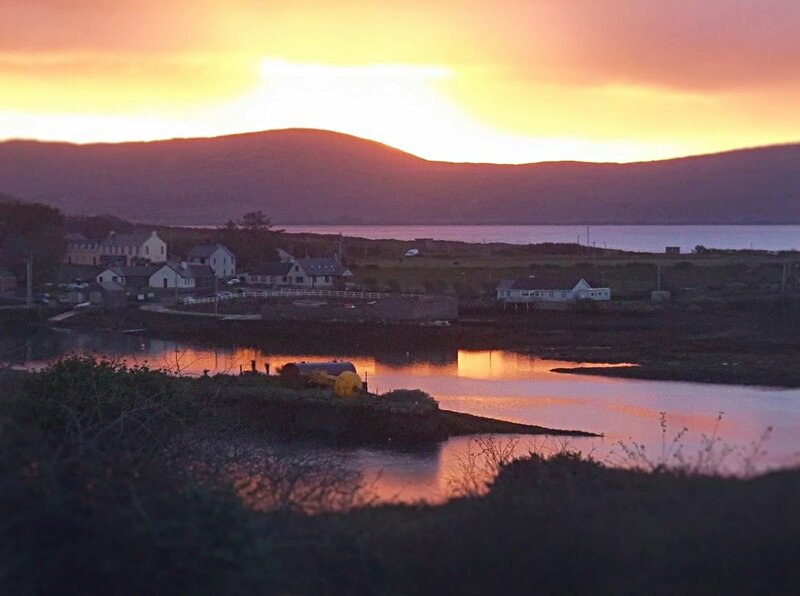 The history and magic of Bere Island is supposed to be breathtaking. Before heading through the gate and back onto the road to our home we lingered a while at the top of the trail and soaked in the views of Castletownbere and Bere Island. It’s really a moving experience to feel the sun on your face, and the ocean breeze in your hair while listening to the seagulls calling and wheeling around the cliffs below. When you come to the Beara Peninsula for a visit make sure you pack a picnic lunch and a camera. I can guarantee that you will be in no hurry to leave. 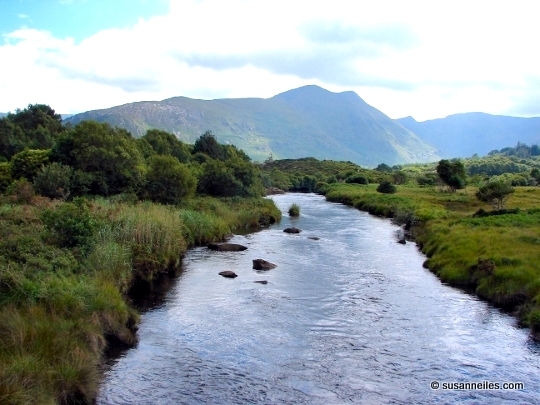 It’s so great to be back to the Ring of Beara Blog again. So many delays but I’m back on track. We’ve just moved house from beautiful Beal Na Lappa and its splendid vistas to a lovely, bigger home in equally beautiful Cahergarriff. If truth be told, I don’t think that there is any place on the Beara Peninsula that isn’t beautiful. Cahergarriff ( Caher: means stone fort or ring fort, Garriff: means rough) is but a stone’s throw from Dunboy Castle. The road to Pulleen Harbour is narrow but car worthy. It’s also a great place for an ambling stroll to take in the sights and the peace of the countryside. Although the area looks untouched and barely populated, it’s amazing to think about the many lives that once graced the area. A quick visit to Archaeology.ie unveiled the remains of a stone fort, standing stones, beehive huts, and an ancient bridge leading to a long, disused road. At one time this little corner of the world was a hub of activity. I’m so tempted to peek into that window, aren’t you? After passing some small farmsteads the land opens up into a boggy lake area embraced by the surrounding hills. I’m tempted to slip down to the lake later to see if I can photograph some of the bird life that visits the area. There’s a grouchy old heron that often scolds me as I go by. If I capture him on film I will share the photos with you here. Ah! Beautiful Pulleen Harbour. Isn’t it a jewel? No wonder so many scenes from the movie Ondine were filmed here. You can watch the trailer for the movie below to catch glimpses of Castletownbere and Pulleen. The movie was filmed entirely here, on the Beara Peninsula. Isn’t the scenery so rugged and gorgeous? (and the landscape isn’t so bad either 😉 ) After checking the archaeology maps more thoroughly I will go on a walkabout to see if I can find the standing stones, the huts or (fingers crossed) the stone fort itself. Stay tuned for more! The thing I love about Spring in Ireland is that it bursts forth in a flurry of romantic, spring-time cliches. Misty, soft, rain? Check. Rainbows? Check. Frolicking lambs? Check. Flowers? But of course…. Throw in a pheasant crowing at the crack of dawn and you know that Spring has definitely sprung! Over the last several days I’ve been awakened by a mysterious sound. The noise was like a cross between a chicken clucking and a rooster changing his mind halfway between a crow and a chortle. An early morning glance out of a misty window revealed a beautiful male pheasant happily nibbling away at the grassy seed heads by the fence. In some mythologies the pheasant is a solar animal and a harbinger of spring. It was my hope that our friendly alarm clock was announcing some sunny weather to come. Sure enough, the sun shone brightly and the misty storm clouds rolled away over the distant hills. The land is gently greening but I know that, with a few more days of sun, the hills will be lush with emerald grass and flowering golden gorse. One of the most delightful things about this time of year is the arrival of the lambs. If you ever need to de-stress I honestly urge you to find a field of ewes and their babies on a sunny day and enjoy the view. There is something so uplifting about watching the little ones sleeping and playing in the grass, such a scene can’t help but put a smile on your face. While the rest of Ireland has been digging themselves out for a week or more, the Beara peninsula has remained a little pocket of green. We happily enjoyed our bright skies and clear roads, until this morning that is.We woke up to a very white view out our front window this morning. It adds a lovely, festive touch to the landscape, don’t you think?